F07 Mochi Mochi blown-glass lamps renew and multiply The Mochi di Saggia&Sommella lamp collection has been renewed with three new models. “The name of the collection – explains designer Valerio Sommella – is tied to the shape of Japanese Mochi rice cakes”. These are traditional Japanese cakes made of ground and beaten rice which is used to obtain a soft white paste and is subsequently given a rounded shape. The same soft shapes presented by young Italian designers in satin-finish white blown-glass for Fabbian. In these three new variations, the Mochi have been renewed and multiplied until they now form spectacular multi-sphere suspension lamps. “The bunch version is the natural evolution of the series – explains Sommella – and stems from the idea of promoting the suspension application of the smaller versions.” In detail, the enlarged Mochi series consists of three models: one suspension lamp with white ceiling light fitting and a diameter of 40 cm and 13 spheres grouped together in a bunch, one suspension lamp with round ceiling light fitting and a diameter of 60 cm with 30 spheres and, finally, a version with rectangular ceiling light fitting measuring 60x30cm from which hang 18 spheres at various heights. 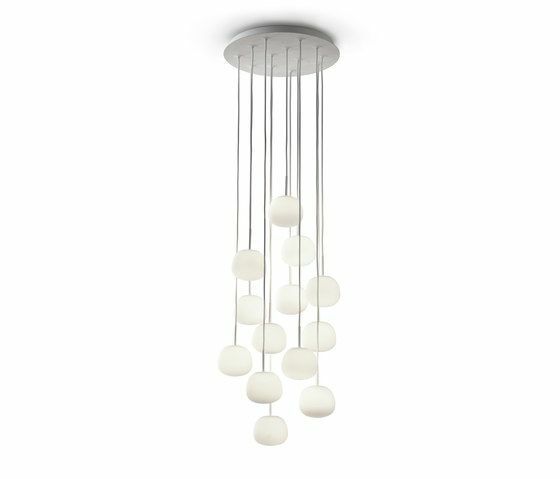 The Mochi spheres of these three new models, in white satin-finish blown glass, have a diameter of 12 cm and are lit by 20W halogen bulbs.